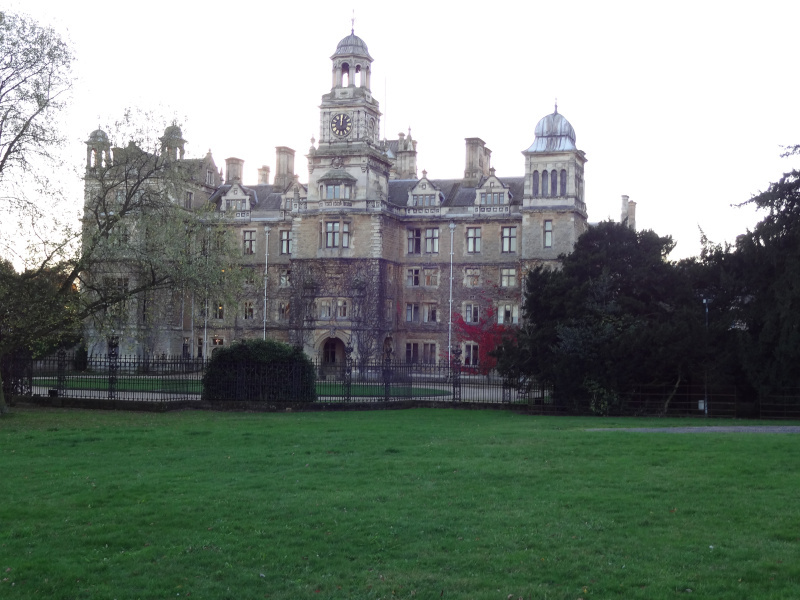 My immediate impression when I saw Thoresby Hall was that it was not what I expected to see. Nor was it where I expected it to be. The house appears as if from nowhere and my first reaction is that I have seen it before. I know this isn’t the case. In the cold of an autumn afternoon the spectre of the house is chilling and mysterious. The house seductively pulls you towards it as the November sun sets behind. Absorbing the east front you sense that something is not quite right. The image is spectacular but clumsy. There are masses of gables, dormers, turrets, towering chimneys and corner belvederes with iron finials. Three towers decorate the front – one at each end with the centre tower taking in the the main entrance and crowned by a three-tier clock turret. An elaborate bellcote takes centre stage with lofty views across the Nottinghamshire countryside. Look closer and you realise that Thoresby Hall is not well-ordered. Each tower is composed differently but architect Anthony Salvin managed to make it a work of art. Thorseby Hall is one of those forgotten country houses. Deprived of the recognition associated with houses of a similar scale it has faded into obscurity. This was once one of the richest seams of country estates. The Dukeries was named after the glut of Dukes who lived in and around Sherwood Forest. Clumber House, Rufford Abbey, Kiveton Hall and Worksop Manor have all been lost. Only Welbeck Abbey and Thoresby remain. 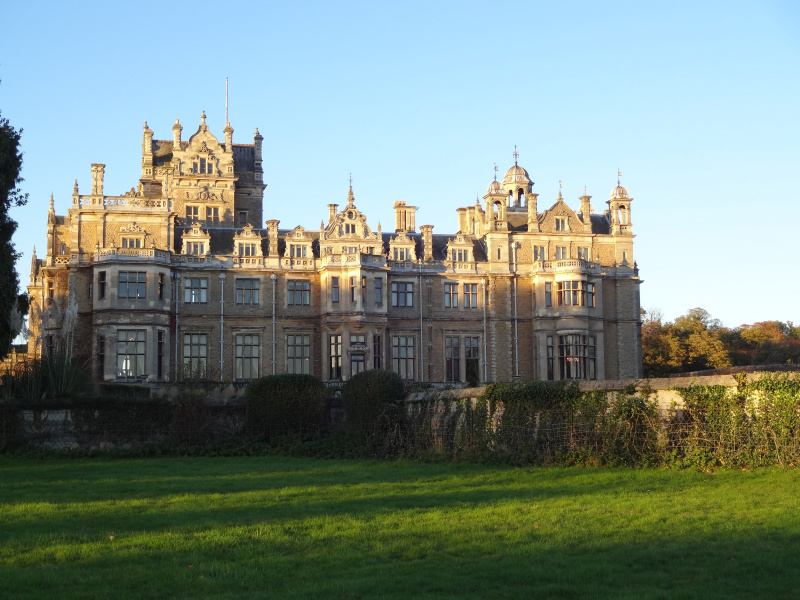 In the 1880s, the 3rd Earl Manvers decided to rebuild Thorseby Hall with income from his Derbyshire coal mines. He would spend a staggering £171,000 to build a grandiose Victorian house that accommodated 46 indoor servants and over 50 outdoor ones. Despite military requisition in the Second World War Thoresby survived as a fully-staffed country house until the death of the 6th, and last, Earl Manvers in 1955. While his widow lived on until 1984 the family’s long association was reaching its end. The National Coal Board, wanting to mine under the house, purchased Thoresby with a view to prevent future compensation claims. The family retained ownership of all fixtures and fittings as a safeguard just in case the house should be demolished. In the end the mining never happened. The Coal Board opened the house to the public for several years but eventually decided that country house ownership wasn’t for them. Thoresby Hall then descended into a decade of uncertainty. In 1989 the house was purchased by an Australian property development company for conversion into a 5-star hotel. The Manvers reclaimed their contents and the house fell empty while it awaited its transition. In the end the enterprise failed and the property was repossessed. A year later another property company attempted to convert it into a luxury hotel while keeping the state rooms open to the public but bankruptcy brought this to an abrupt end. Thoresby Hall was now at its lowest point. Decay set in as the untended roofs started to leak and dry rot threatened the resplendent interiors. The ultimate humiliation was when the National Trust declined to take over the property and English Heritage put the once noble house on its ‘at risk’ register. Rescue would come in 1998 when Warner Holidays bought Thoresby Hall spending vast amounts of money to restore it to its former splendour. In a salute to the past the hotel would open a year later with Lady Rozelle Raynes, daughter of Countess Manvers, officially opening it. The downside to all this is that Thoresby Hall is now overlooked as a country house. Its future is secure and and appreciates the thousands of paying guests but it remains unappreciated by heritage devotees. Visitors to Thoresby are met with modern extensions and car parks with the full brilliance of Salvin’s house lost somewhere behind.